If you’ve ever made up a song about what you’re doing or hummed while waiting in a queue—you’ve demonstrated a behaviour explored in the winning video entry for Victoria University of Wellington’s annual Summer Gold Competition. Psychology and Theatre student Pauline Ward’s research project investigates how singing is used in our day-to-day lives and as a conversational tool, and won her Best Overall Video and $1,000 in prize money. The judges praised Pauline’s use of simple, vibrant animations and narrative in her video to present the research in an accessible and relevant way. Her work was supervised by Professor Ann Weatherall from the School of Psychology. The Best Overall Poster category and $1,000 prize was won by Architecture student Isabella Lum. Her winning poster analysed how density is defined and measured in New Zealand, as the country’s housing landscape shifts to one with denser and more diverse housing. The judges commended Isabella’s portrayal of a difficult topic to non-specialists and her well thought-out research, which was supervised by Professor Brenda Vale, Daniele Abreu e Lima, and Nilesh Bakshi from the School of Architecture, and Nick Barratt-Boyes from Studio Pacific Architecture. The Summer Gold Competition aims to acknowledge the research achievements of the students who participated in the recent Summer Research scholarship programme by inviting them to design a poster or create a video about their research in collaboration with their supervisor. Isaballa Lum with the poster Quantifying New Zealand’s urban density. Pauline Ward with the video Singing in conversation. Lucy Jaegers and Florence Hillyer-Brandt with the video Headlice! Theo Calkin with the video Geotrips. Timothy Gastrell with the poster Teaching machines to recognise emotions. Celia Hall with the poster Rākau Rongoā Garden. Chiara Shim with the poster Remote Residential. Tessa Lynch with the poster The design of acute mental health wards. MacKenzie van Fulpen with the poster Influences on people’s decisions around emerging health technologies. Sophia McKellar with the poster The building of Māori community connections to places through environmental activism. Ellen Tapsell with the poster Te Whakamaru o Horohoro Maunga. Millie Godfrey with the poster The Pulter Project. 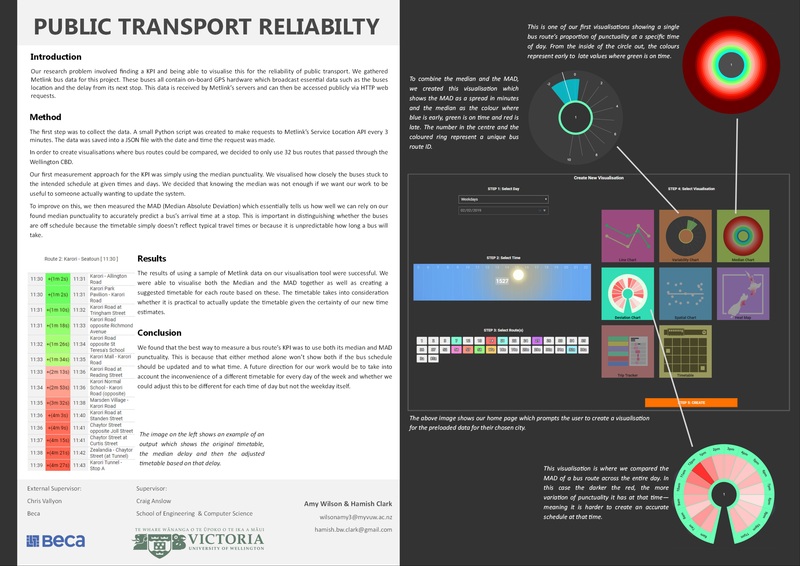 Amy Wilson and Hamish Clark with the poster Public Transport Reliability. Jordan Willis-Love with the poster A century of cancer awareness health promotion. 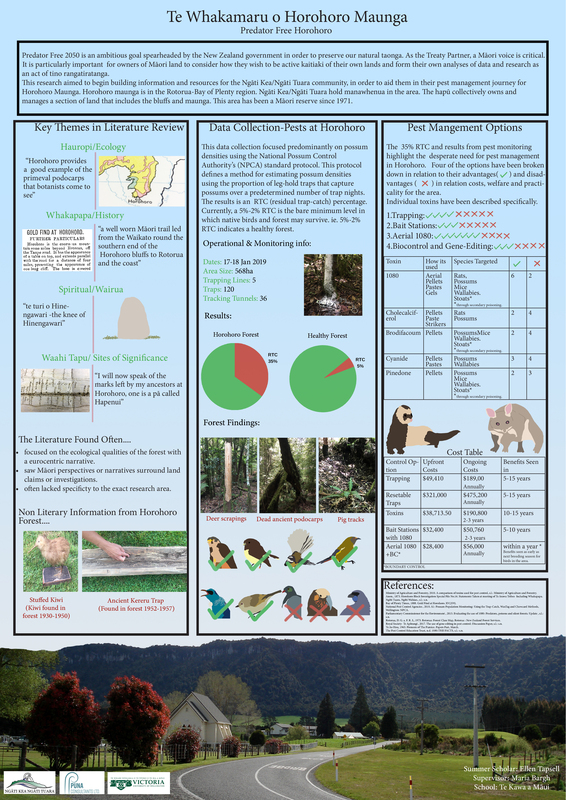 Amy Gault with the poster The vulnerability of Aotearoa to introduced mosquito species. 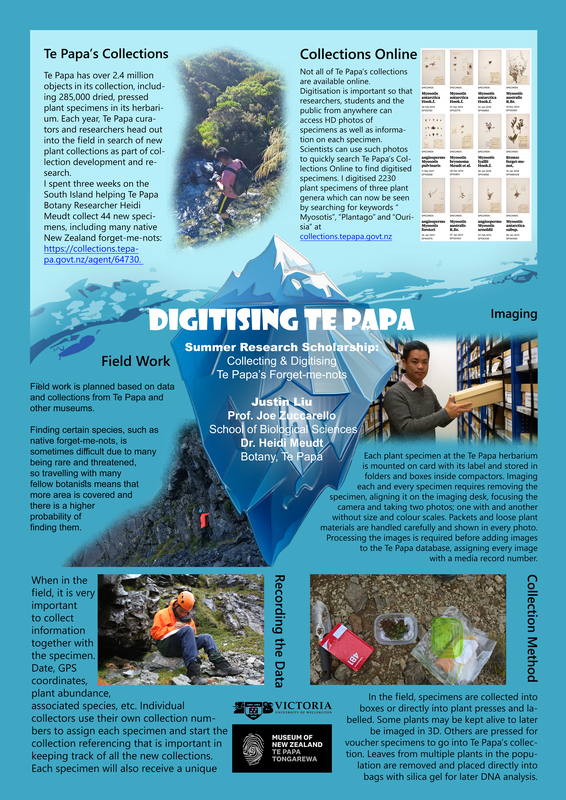 Justin Liu with the poster Digitising Te Papa. Alana Harrison with the poster Evaluating consumer responses towards the health star rating system.